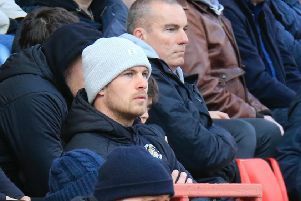 Boss Nathan Jones is remaining hopeful that Hatters supporters could see goalkeeper Jonathan Mitchell in a Luton Town shirt once more next season. The 21-year-old, who was recalled by Derby County on Tuesday, impressed greatly during his brief spell at Kenilworth Road, keeping two clean sheets during his five games. On whether he might return as Town’s number one next season. Jones said: “You never know, I wouldn’t want to comment on anything, if Derby are looking at loaning him out again then we would naturally be interested in that, because of how well he’s done for us. “He was the first one that we earmarked and I think it was a very successful time personally for him. Jones had hoped to have Mitchell between the posts for Luton’s remaining seven games of the League Two campaign, but once Lee Grant got injured at Pride Park, the Rams required him back to cover number one Scott Carson. Jones continued: “It’s not a problem, it’s disappointing, because we enjoyed having him around. “We thought we were getting a good young keeper in, one we were gauging in terms of moving forward, as it was, we were only able to see him for the limited number of games we did. “But we realise this is what happens when he’s that sought after. We felt we were fortunate anyway to get him, and with the squad that Derby have got and what they are challenging for this year, it’s a bit of collateral damage and something we had to put up with. With Luton allowing Mark Tyler to rejoin former club Peterborough on loan, a move that will become permanent in the summer, Jones, who now only has Elliot Justham and Craig King at his disposal, confirmed he will be looking to add a keeper for next season, whether it be Mitchell or someone else. The Town boss adding: “We want to move forward, so by allowing Tyles to further his career, we were always looking at another keeper. “At this time of year, if you’re looking at someone for next year, it would make no sense in just bringing in someone to sit on the bench. “That’s the thing we explained to Elliot that if we wanted to move forward, the things we were looking at, they had to come in and have an opportunity for starting and then it’s up to them what they do. “That was the thing in bringing in Jonathan and it proved a successful one because I think he endeared himself to the people here, certainly did to us and just rubber stamped what we knew really.